Our site at Exton is just minutes from the incredible Rutland Water Nature Reserve. It provides one of the most important wildfowl sanctuaries in Great Britain and is home to the Rutland Osprey Project. The reason the Osprey Project was such a huge achievement is because ospreys had become extinct as a breeding bird in Britain as early as the 1800s. They tentatively began to recolonise in Scotland much later, and by the 1990s English Nature and Scottish National Heritage decided something needed to be done in order to speed along the process. That's where Rutland Water came in. It was observed that Rutland Nature Reserve attracted many of these birds as a convenient place for a stop-off point. The first attempts to attract the birds were made in the 80s but the translocation project at Rutland Water was finally put into action during 1996, following 18 months of negotiation and research. Twelve chicks were originally chosen to be moved to Rutland Water and were carefully introduced to their surroundings and monitored until the time came for them to migrate south during the autumn. It was hoped that eventually, when they reached breeding age at about three or four years, the translocated males would be able to to attract passing Scottish females. In 1999 the chicks began to reappear after their initial migration and in 2001 the project reached a milestone with its first breeding success. A male numbered 03 that had been translocated in 1997 raised a single chick with an unringed female. This pair was the first breeding pair of ospreys in Britain for 150 years. Between then and 2014 a total of 87 chicks have fledged from the Rutland Water area. It is incredibly encouraging that not only translocated birds are responsible for the breeding successes but also many Rutland-born chicks returning to their nest sites as well as various Scottish females. Osprey 03 has continued to breed every year since his first success and returns each year to what has become known as nest site B. Older ospreys tend to mate for life if they can and are very loyal to their nest site. They will return to it year after year and rebuild or renovate their last year's nest. This is the case for 03 and his mate of the last six years at their nest site B. One other nest site that is a particular favourite at Rutland is the Manton Bay nest. A Scottish female named Maya has been returning to this site to breed since 2010 and can be seen on the webcam that is in place overlooking her nest. A live feed of the 'nest-cam' can be viewed at all times during breeding season, so anybody can keep up to date with the eggs' and chicks' progress. 2015 is Maya's 5th year at Manton Bay; her and her mate '33', one of the 2011 Rutland-born chicks returned to the site early April and were seen a great deal around the nest area, they began rebuilding and by the 20th April had three eggs sitting in their nest. 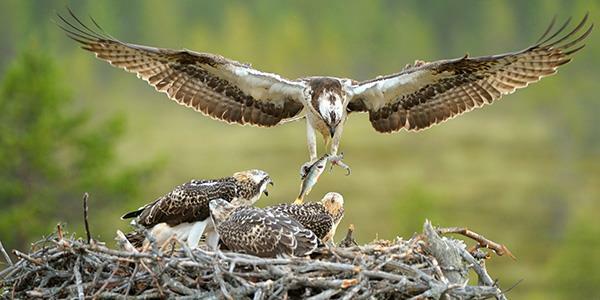 Ospreys share incubation duties and the process can often last between 35-40 days. People keeping an eye on the nest-cam eagerly awaited the hatching which was expected around the end of May. On Friday 22nd May and over the weekend that followed, the fantastic shots of Maya's hatching eggs were caught on camera. Another year's success! To view the Manton Bay nest-cam on the Rutland Osprey Project website click here. To re-live the moments of hatching, and learn a little more about Maya and the Manton Bay nest, take a look at the Rutland Osprey Project Blog here. When visiting Rutland Water, the place to start is the Lyndon Visitor Centre. Here you will find information on the Osprey Project as well as live nest pictures when in season. There is a great viewing area too for spotting the incredible birdlife for yourself, and lots of information about the reserve. Click to view the Lyndon Visitor Centre website.